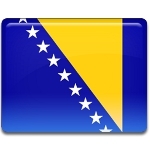 Bosnia and Herzegovina consists of two autonomous entities: the Republika Srpska and the Federation of Bosnia and Herzegovina. Each entity celebrates its own public holidays. For instance, General Framework Agreement Day is celebrated in the Republika Srpska on November 21. The General Framework Agreement for Peace in Bosnia and Herzegovina (it's also known as the Dayton Agreement) put an end to the Bosnian War, that lasted for three years and a half. The agreement foresaw the creation of Bosnia and Herzegovina, consisting of two autonomous entities. The Presidency became the highest administrative body, serving as head of state. The Presidency consists of three members – one Bosniak, one Croat and one Serb representative. The Dayton Agreement laid the foundation of modern constitutional structure of Bosnia and Herzegovina, however, the issues of peace and war are still present on the territory of the state. The Republica Srpska annually celebrates the anniversary of the end of the conference at Dayton on November 21, bribing it autonomy and peace.